This statement is what we hear - a lot! It is one of the most common misconceptions when it comes to matched betting. 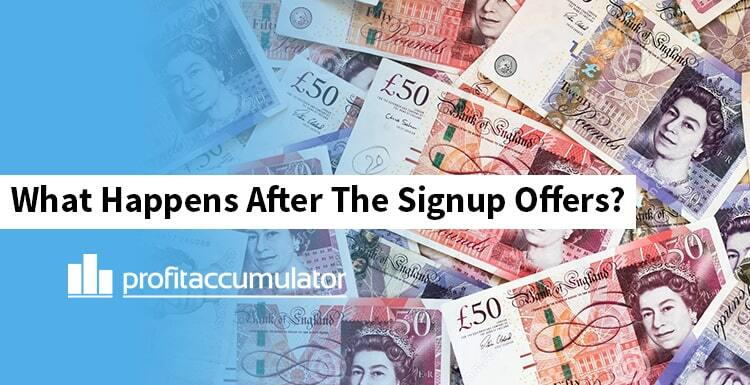 People may believe that, once the signups are complete, then the matched betting fun is over. Well, I am pleased to say that, this is very far from the actual truth and that the matched betting fun has only really just begun! All of the money that you've earned from the signup offers, so far, is now part of your “Matched Betting Pot”. You're now going to leverage this money and use it to grow that money-pot, and your profit, more and more each and every month through the technique of “Matched Betting Reloads”. Reload offers are the offers that bookies send out to existing customers to keep them betting. These offers can come in a wide variety of different forms and guises but, by using the skills that you have acquired through the signup offers and by learning and developing new, more advanced matched betting skills, we can take these offers and continue to make continuous profit. The "How to make a £1000 a month thread" and the "How to make to £300 a month part time" threads. So, in a nutshell, you can look to earn around £300 to a £1000 month regularly through reloads. You should take these figures as a ballpark amount. The amount you can potentially make is really down to you and your circumstances. You may earn more, or you may earn less, but it is worth pointing out that both of these threads regularly far exceed their profit target every single month. So do not limit yourself and, really, just go for it! Reload offers can be be accessed via either the website or the forum. It is down to personal preference as to which approach you prefer, although probably a combination of both is the best way to find them. Within here, each offer gives you the option to view the offer, which takes you through to the offer page and, when within an offer, you will see the full written instructions on how to do the offer. Some of the reloads will also have an accompanying video guide. If you are looking for reloads on the forum, then on the forum home page, move down to the reload offers category. Within here you will find the major sub categories for popular reloads like horse racing and accumulators.As well as these you will also find all of the current/ongoing reload offers as well as helpful threads for finding matches. To find certain bookies, or days an offer is eligible or to search via sports or casino you can use the tags system. Once in here you can either choose from the list or type in the search text cell to search for a specific bookie, site or offer. Please note, the casino offers are another form of matched betting, it's not normal casino use where you might just play live casino UK. Reload offers can be very different to the signup offers you've done so far. It's important not to get overwhelmed and not to get ahead of yourself. Take your time to go through each one, the more you do the more experienced and skilled you will become. Matched betting is very much a marathon and not a sprint. Check out our free trial which provides new members a chance to see how matched betting works, with step by step demonstrations, and earn around £45 in the process! Click here to get involved. Sign up today and you can earn up to £45 from our free trial. If you like what you see, then you can sign up to the full membership and gain full access to the whole Profit Accumulator package. All the offers, all the software and full forum access. Click here to upgrade to Platinum membership.